The Works and Gordon Jackson. Photo Courtesy Deryk Wylde, ORR-e. 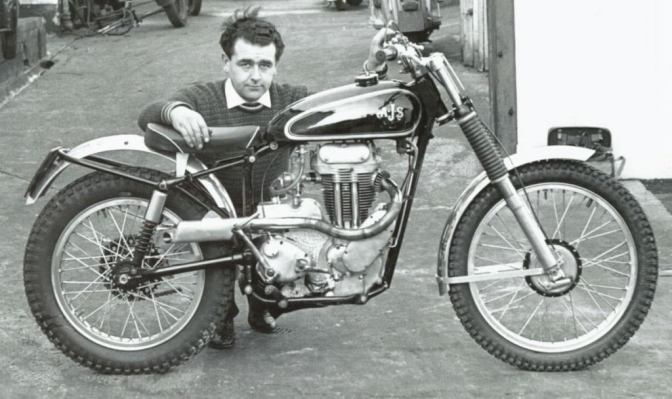 Although there were a lot of “Works” AJS builds in the rigid era that should be worth a mention, It is not until Gordon Jackson won the Scottish Six Days trial losing a solitary dab, and that famous Peter Howdel shot of the incident. That AJS trial machines were brought to a greater following. The lightweight machine, and the even lighter later model built by the competition staff at Plumstead (London) was a eye opening of what could be done to make a machine as heavy as the production bikes were, into a more compact arrangement of cycle parts around what was and always will be a tall engine. Brakes where smaller single sided but still did the job and the lowering of the rear subframe and using smaller Girling suspension units was a revolution in its self. It is only a shame that the management were blind stubborn or both, because when suggested that they should make production versions of the “Gordon Jackson Replica” they just laughed and said,” don’t be stupid, people want more on a machine” not less! 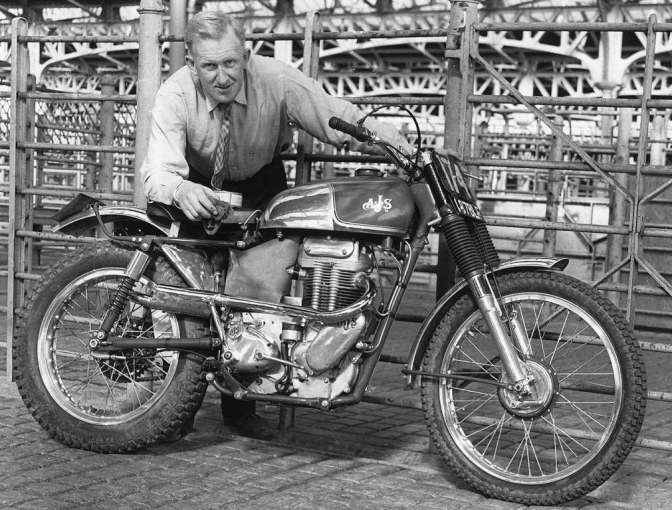 This again was one of the most photographed machines in 1962, and set the trend for the future of the AJS trials mark. 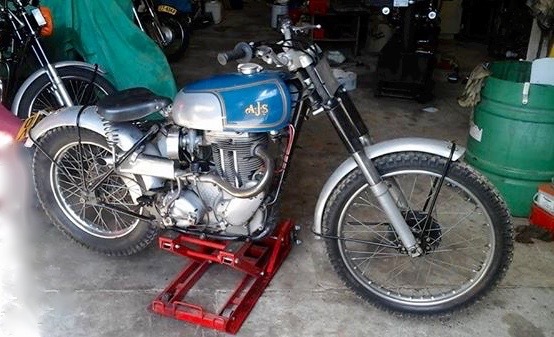 Photo Courtesy Deryk Wylde ORR-e.
Long after AJS had hung up its boots and shut the door of the factory. Old British bikes lingered on for a few years but most competition riders now wanted a then, modern fancy two-stroke to ride. But a few chaps up Yorkshire thought it a good idea to set up a trial like the past, for the old British shall we say bikes built before the mid sixties, so a New interest was now found for redundant machines. And even a Series of these trials took off, and now riders old and new wanted to buy one of the relics of the past. And so started an industry in re-manufacturing or rebuilding these machines. The problem was that parts were now scarce, and the only way of getting them was to re-manufacture them. Maurice was the chief exponent at the start of this journey and his gears are still worshiped today like the holy grail, and if it is a Maurice Hocking built engine or machine, you have something that is priceless and worth its weight in gold. Photo Courtesy Bary De Long. Peter worked for the Rickman Brothers. As a development engineer, and built a lot of the prototype bikes up. The frame was broken under the steering head and had been bodged as a repair, so being a frame builder with knowledge needed and the tools to construct a New frame, this is what Peter did, and then like every good story, everyone wanted a Peter Pykett AJS trials bike, and like Maurice, if one comes up for sale now you will have to re-mortgage. When Peter stopped making his machines, there was still a thriving market for these pre unit machines as the trials series for them continued to grow. 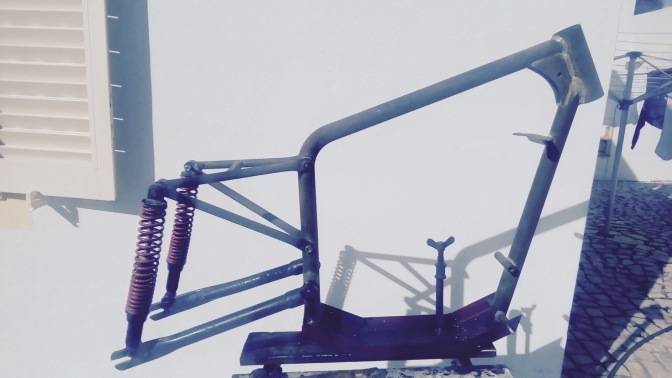 Andy built himself a machine from the ground up with his own replica frame kit. And others wanted one of these frame kits too. 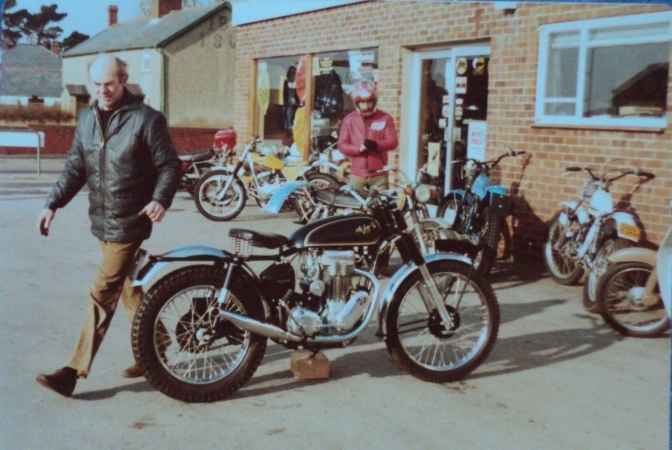 The late Len Hutty had his Matchless machine stolen and went to Andy for a frame to build another machine, this also helped with sales of more frame kits around the world, as these immaculate builds were the ones to want. Andy as far has I know has now stopped building these kits, but I will ring him and find out for you. 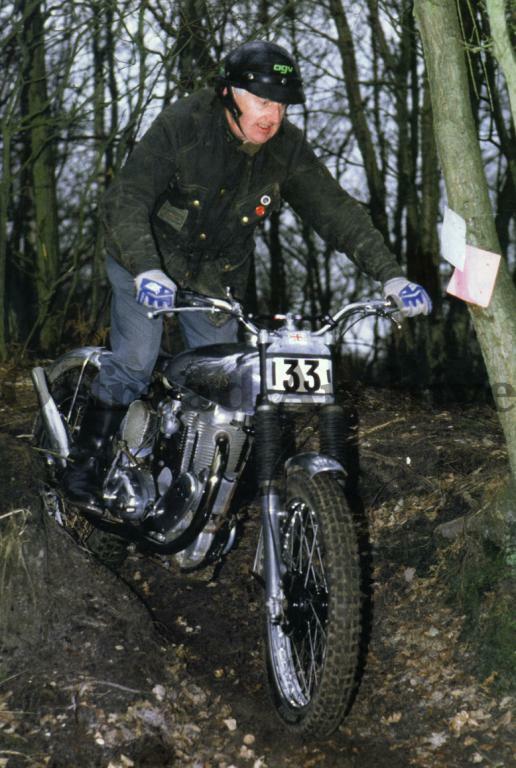 But don’t forget Jim built over one hundred machines in a short time at “BikeCraft”, and five of these were AJS trials bikes, and Jim even went so far as having the correct castings remade for the swinging arm pivot etc. Again these machines are now revered in there own right and command the same sort of respect as the original machines from Plumstead. 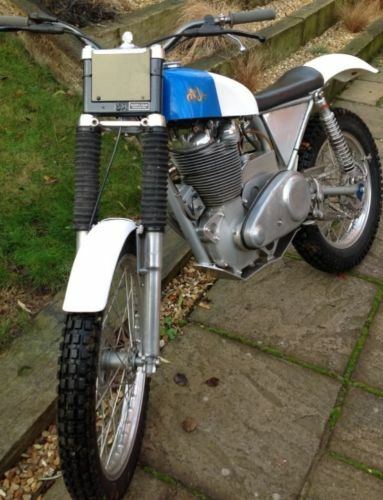 Photo Courtesy, eBay, Said to be a Shane built machine? Shane has taken the AJS trials breed to another level, and although a lot would frown upon the three machines that he has built? As being “Specials” in the class of build, there is one thing you can say, the machines are an engineering work of art. Not only the lightweight oil bearing frame construction but also the total build. The engine for instance uses a Jawa speedway crankshaft, running a Westlake connecting rod attached to a BSA B50 piston, running in a barrel that Shane had a pattern made for and then cast and linered. The AJS copy-swinging arm was also constructed out of aluminum. Stainless exhaust alloy air box and NEB belt drive cover complete a spectacular modern machine. There are others that should get a mention like Mark Francis and Ken Kendell for the superb AJS/Matcless engined outfit. But again Seven is Seven for Now. and as I say Seven is seven. I thought after receiving a email from Tim Hartshorne and Darren Cooper. 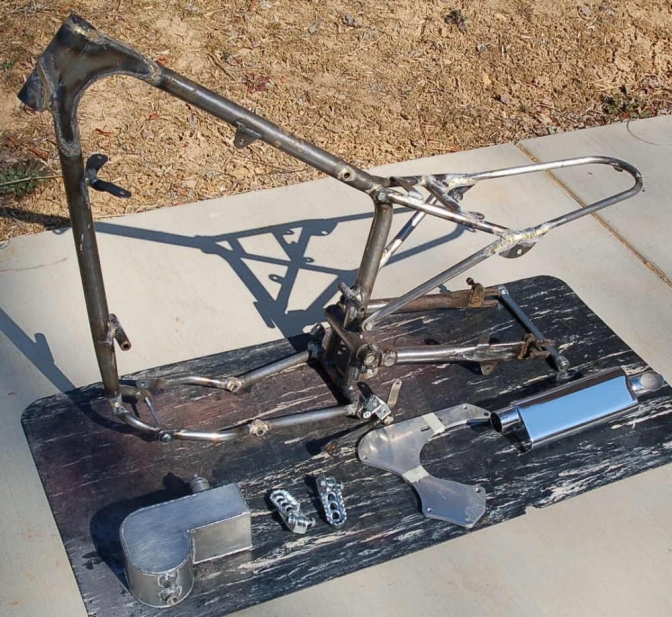 Include their modern take on the AJS competition frame on this page. as it seems appropriate. This is the frame for the AMC engines. The complete kit costs £1860. 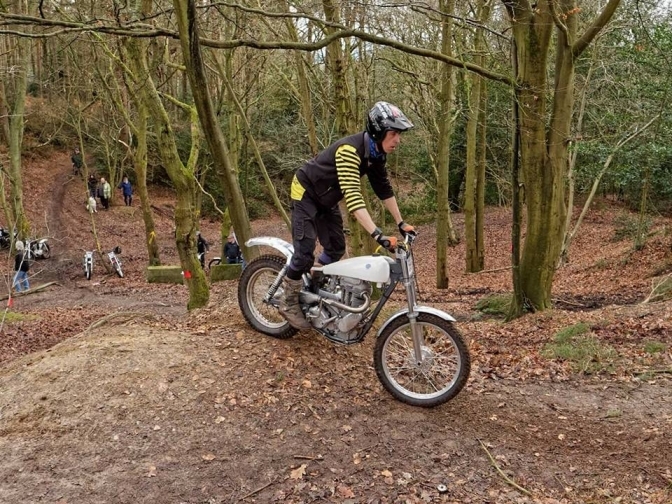 Tim riding in the 2018 TALMAG trial. on his Classic Competition Components machine. after special test time. 0 marks lost. Ariel frame on the Ariel builds page. Just has a comparison to what Tim and Darren are building here below is a frame very simular built in the early ninties. 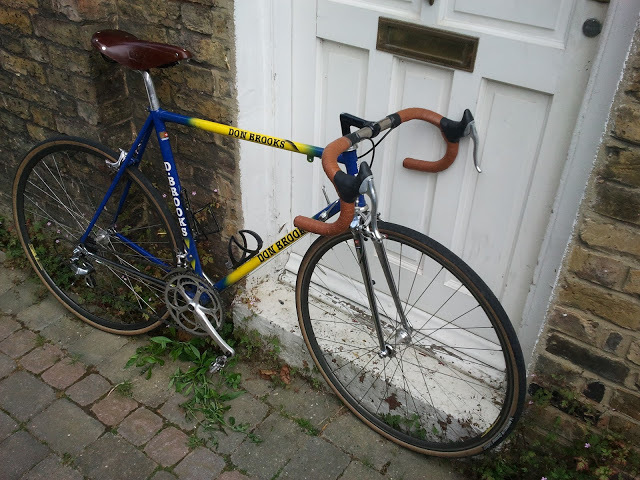 This one built by renown cycle race frame builder,"Don Brooks" and sold by Jim Susans.